Wins Park Casino will then reward you with a bonus (Welcome Bonus is for new players only). 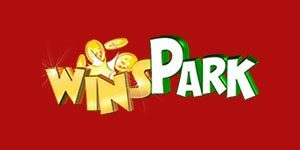 The terms and conditions of the bonuses vary between different casinos and might also change over time and between different countries, so it is important to compare the different offers and read the T&C for Wins Park Casino before signing up. WinsPark Casino is managed by Hermion Ltd, a company operating under the laws of Cyprus and acting on behalf of Curacao licensed Twino. The casino itself was launched in 2018, with a vision of becoming the ultimate gambling destination and raise the industry quality standards. Having just started their online journey, the dream of conquering the market still seems far away, especially considering the fact that the casino has a rather limited selection of games provided by Netoplay and that the license issuer is relatively unknown when compared to the far superior MGA or UKGC. What they lack in the game assortment, the casino tries to make up for in bubbly profile and 100% deposit match bonus offered to the new members. In a process of creating your account with WinsPark Casino, one can’t help but notice that the site layout is a bit disorganized, almost as if someone turned the home page upside down and scattered the content across the screen. For example, most of us tend to search for the registration tab in the right, upper corner and although the huge Sign-Up & Play red tab is practically starring in your face, you will easily miss it since it is mispositioned and placed all the way to the left, at the side of the screen. This is not a huge deal breaker, but it does affect the navigation, especially with the Contact, Help, and Banking bars placed at the top of the screen. Site layout aside, some of the factors that cannot be so easily disregarded and can be considered quite alarming are the casino’s dormancy clause and an incredibly short 5-day limit for ID submission. If the players fail to log into their accounts for 180 days, their account will be immediately closed, and all funds seized, which can be viewed as extremely harsh and uncalled for. There are also some inconsistencies with the casino’s withdrawal limits, which members can find extremely confusing, especially when in a position of requesting the payout. Since WinsPark Casino only has one partnering operator (for the time being) you will be able to run through their offer fairly quickly. The games are categorized as Top Rated, Slots, Scratch Cards, Bingo & Instant Games, with the latest winners displayed at the top of the gaming offer screen. There are no advanced filters that will narrow down the search, although, considering the number of the games available, you will not need any. If you would like to try the games, you will have to create an account, however, the casino will offer two options: Real-Money and Fun account, which can be used for the testing purposes. There are currently 12 slot games in this category – Wild Honey, Beer Garden, Spinning Fruits, Vegas Lights, Jack is Back, etc. Netoplay is not a developer you will come across very often – they are the suppliers for no more than a couple of online casinos, including Wins Park, and their focus is on Video Slots, Scratch Card games, Bingo and white label solutions. The animation style is colorful and bubbly and the themes featured in their games range from classic fruit slots to animals, mythology, and adventure. Netoplay does not offer table or casino games and you will not find any in Wins Park casino. The live platform is not included in Wins Park casino offer and Netoplay has not revealed any future plans of introducing Live Tables software for their operators, nor are there any indications of casino expanding the list of the gaming providers. 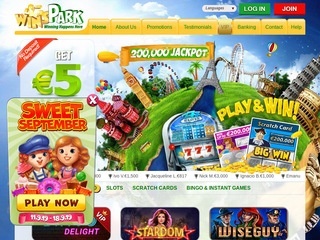 The details regarding the payment methods accepted by Wins Park are provided under their Banking section, located at the top of the casino page. To place their first deposits, players can use Visa, MasterCard, Diners Club, Paysafecard, Neteller, Zimpler, Trustpay, Skrill, etc. The money can be transferred to your casino cashier in one of the following currencies: EUR, USD, GBP, AUD, SEK, NOK, CHF, and CAD. According to the casino’s withdrawal policy, the monthly limit is €3,000 and only the VIP members can withdraw more – that piece of information is not disclosed under the casino User Agreement and according to the payout policy described in that section, the withdrawal limit is €15,000, which is the discrepancy mentioned earlier. The pending time is 2 days and the settlement period depends on the method selected. Wins Park casino support can be contacted via Live Chat, email or phone. The Help section lists the most frequently asked questions and answers, but if you would prefer to speak to a customer representative, the casino will provide a call back service, available after login into your account and selecting the Main Menu icon.